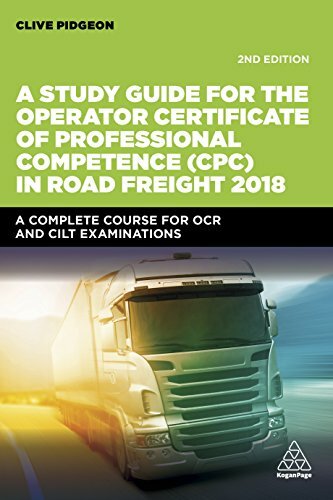 A Study Guide for the Operator Certificate of Professional Competence (CPC) in Road Freight 2018 is a vital study guide that offers the thorough preparation needed to pass the tough CPC exams in the UK. It covers the examination method used by the Oxford, Cambridge and RSA (OCR) and the Chartered Institute of Logistics and Transport (CILT). This is the Level 3 standard qualification overseen by The Office of Qualifications and Examinations Regulation (OFQUAL) and the Welsh Assembly Government, which is required by any person wishing to operate vehicles over 3,500 kg, the maximum authorised mass for hire and reward, in the UK and internationally. A Study Guide for the Operator Certificate of Professional Competence (CPC) in Road Freight 2018 has been extensively revised to include all the new legislation. It covers the eight study sections that the directive requires: civil law; commercial law; social law; fiscal law; business; financial; management of the undertaking access to the market; technical standards and technical aspects of the operation road safety. It features many case studies, examples, diagrams and graphics. New to this edition: test questions after each section.